Netdata is an real time performance monitoring tool which provides accurate performance monitoring through its comprehensive web dashboards that visualize the processes and services running on your Linux Servers. 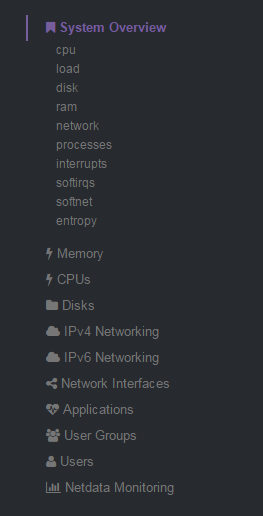 It also monitors metrics about CPU, Memory, Disks, Networks, Processes, and lots more. This guide will walk you through the steps to set up Netdata using its built-in web server or, optionally, using Nginx on Ubuntu 16.04 server. One Ubuntu 16.04 Server installed on either (physical or virtual) machine with a sudo non-root user and a firewall. Git installed on your Ubuntu 16.04 server. To begin instalation of Netdata itself, we must use the project's GitHub repository. Clone the Netdata repository into your Ubuntu's home directory. Next, Move to the newly cloned directory. Lets build and install the application using the netdata-installer.sh shell script in this directory. Make sure to append sudo here, otherwise the way in which Netdata collects system data (through data collectors) would not function properly. The output you'll see at first contains information on where Netdata will store all of it's components. You can read through these so you are a bit more familiar with how the program is spread out over the filesystem after its installation. 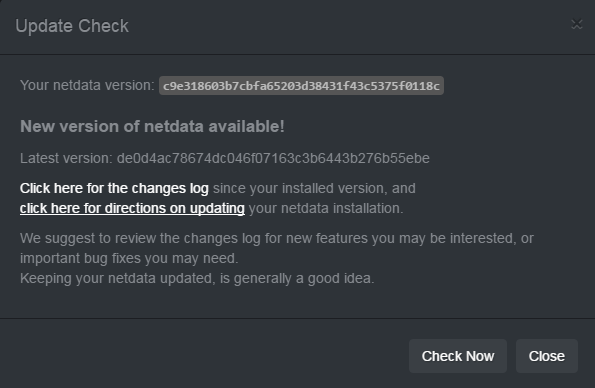 Congrats, Netdata is now installed and running successfully, and will run automatically upon rebooting the server as well. If you have UFW enabled, you'll need to open port 19999 for Netdata's internal web server. At this stage, you can view the default dashboard by visiting http://ubuntu_server_ip:19999/ in your favorite browser. Here, You'll see an overview of the system's live metrics. This is a good check that everything's working so far, but before we explore the GUI, let's customize Netdata. You can explore Netdata's current configuration in your browser by visiting http://ubuntu_server_ip:19999/netdata.conf. you can see here that all or most of the configurable options are commented out (i.e. prefaced with a #). This is due to Netdata's configuration works by using a set of assumed defaults. Any disabled settings use Netdata's default value; if a setting is uncommented, the value specified will override the default. This keeps the configuration file contained to only what you've changed. Lets get back to server, the configuration file itself is /etc/netdata/netdata.conf . The option we'll customize in this article is the history parameter. This controls the maximum size of the memory database in use by Netdata. Keep in mind that the above estimations are based upon the number of charts in use by the stock dashboard. Removing or adding custom charts in the future will influence these estimates. Edit Netdata's main configuration file with nano or whatever your favorite text editor. Locate the history option in the [global] section. Replace the 3600 value to the one you have already decided. We're using 14400, which gives us 4 hours of data retention. Make sure to also uncomment the line by deleting the # symbol so this option is no longer ignored by Netdata. Save and close the file after making this change. While this modification likely increased the amount of RAM that Netdata will use, the next modification we'll implement in the upcoming step should reduce it significantly. To permanently enable this in the Linux system kernel, edit the /etc/rc.local file with a text editor. This /etc/rc.local file or run control file is executed after all other normal Linux system services and processes are started. It is useful for specifying custom services — or, in our case, for enabling KSM at server run time. The first command adds a 1 into the run KSM kernel file, which enables the feature. The second command tells the the KSM daemon to run once per second and evaluate 100 pages for de-duplication. Once you save and close the file, KSM will now be enabled the next time the server reboots, and persist through future reboots. To enable it for the rest of this server's current uptime, you need to run the two commands you added to rc.local manually on the command line. First, initiate and enter a new shell session as the server's root user by using the -s flag with sudo. This is necessary because the two commands from earlier use output redirection (via the > operator) and need to be executed by a root shell to succeed. Then, leave the root shell and return your normal shell session. Finally, to apply all the changes we have made in this step and the step before this, we must restart Netdata. Here, you can verify that KSM is now enabled by looking for the newly added active KSM chart in the Netdata dashboard. This is found in the menu tree on the right, under Memory > Memory Deduper. Now you know that the dashboard and KSM are working, it's worth granting access to the dashboard through a web server like Nginx instead of the built-in web server. This isn't completely necessary, but it is recommended, so follow the next step to set it up. Hosting Netdata using Nginx makes it easier to secure access to the dashboard and also lets you point to other servers' Netdata dashboards in the future, should you need to. You need to install the apache2-utils package. This package contains the htpasswd program, which we're going to need later on for securing access to the dashboard page. Now, create a new Nginx host configuration file. Note that here, we're using a file in the /conf.d directory, but you could use /sites-available and /sites-enabled if you're using Nginx for things other than Netdata. This configuration file will tell Nginx to proxy incoming requests for the dashboard page. We'll also add a simple authentication prompt so only those with the correct username and password can access it. Following is the entire configuration file for you to copy and paste. Change the two items for the listen and server_name directives to your server's IP address and allocated domain name, respectively. Don't forget to include the terminating ; at the end of each. If you don't have a domain name, you can leave the server_name directive as example.com. Now save and exit to return to the command prompt. This upstream module named as netdata-backend targets the built-in Netdata web server by using the server's loopback address, 127.0.0.1, and Netdata's port, 19999. A keepalive directive sets the maximum number of upstream idle connections that can remain open at any given time (for each Nginx worker process). This upstream module definition is required later on by the proxy_pass directive. Directly after this is the main server block. The first two line in the block defines the external IP address Nginx should listen for when clients attempt to connect. The server_name directive tells Nginx to run this server block when a client uses the specified domain name. The last two lines in this snippet set up the simple HTTP username and password authentication. It does this using the auth_basic module to display a username and password prompt. You can customize the message for the prompt; here, it's set to Authentication Required. auth_basic_user_file designates a file name and location to store the login credentials of the authentication prompt, created later on in this step. The last location block, nested inside the server block, handles the proxying and passing on of incoming requests to Nginx. Basically, this code is what passes client requests to the Netdata web server, and in turn the dashboard. The proxy_pass directive line refers back to the upstream module at the start of the file must point to it by name, netdata-backend. If you haven't already, you can save and close this configuration file. Here is where the htpasswd program from the apache2-utils package helps us create the user login credentials for the dashboard login prompt. First, we'll create a username and password. Run the following command, replacing sammy with whichever username you'd like to use in Netdata. When prompted, enter the password you'd like to use. This creates a file at /etc/nginx/netdata-access that contains the username and password you provided. The generated password is encrypted within the file, so it cannot be seen as plain text. Restart Nginx to make the new configuration we added active. To test the Nginx configuration for the first time, visit http://ubuntu_server_ip in your favorite web browser. You'll see an authentication prompt. Enter in the username plus password you provided earlier on in this step to get access to the dashboard, which we'll explore in Step 5. If you didn't follow the Ngnix installation (Optional) step we have mentioned above, visit http://ubuntu_server_ip:19999/ in your favorite browser now to access the dashboard. You can see the dashboard and an overview of the system's live metrics. The HUD style indicators at the top of the page change when you mouse-over each time period in the subsequent graphs. The individual graphs and charts in this overview section give detailed accounts of each system aspect, ranging from CPU to memory to networking traffic and more. Charts are interactive and can be dragged left or right with your mouse to pan back and forth through the different time intervals. Holding down Shift and scrolling in or out with your mouse wheel on a graph will narrow or widen the time markers. Double click on a chart to reset it back to it's default appearance and view. The quickest way of navigating around the dashboard is by using the menu tree on the right of the page. This changes focus and color depending on which section of the page you are currently viewing. Scrolling down the page or using the menu tree gives access to even more in-depth charts. These are very detailed and are controlled in the same manner as the graphs in the initial overview section. There are many of these extra stat-specific charts available through Netdata. One important part of the GUI is the update page. Netdata receives updates quite regularly and keeping your installation current is easy to do. The dashboard contains an Update button at the top that allows you to check whether a new version is available for download. Clicking this button opens a new menu with more details, and a Check Now button to manually check for updates. If there's an update available, you just need to run the supplied update script from the Netdata Git repository, which we cloned to the Linux user's home directory in the first step. That is, when an update is available, just run sudo ~/netdata/netdata-updater.sh from the command line.